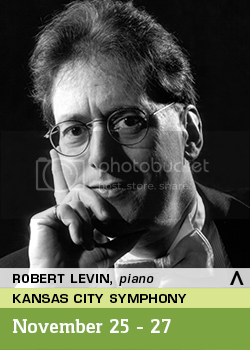 The Kansas City Symphony presents “Mozart, Beethoven and Haydn” featuring guest pianist Robert Levin and led by guest conductor Bernard Labadie on Nov. 25-27 in Helzberg Hall at the Kauffman Center for the Performing Arts. Levin performs Beethoven’s Third Piano Concerto, and the program also includes two Mozart overtures from Don Giovanni and La clemenza di Tito, as well as Haydn’s Symphony No. 98. Tickets from $25. Call the Box Office at (816) 471-0400 or select your seat here. Tell us about Beethoven’s Third Piano Concerto, which you’re performing with the Kansas City Symphony for the Nov. 18-20 concerts. It is deeply influenced by Mozart’s Concerto No. 24 (K.491), which is in the same key and had a profound influence on Beethoven. An oft-cited anecdote has him strolling through the Augarten, a public park in Vienna, with his friend the composer and later music publisher and merchant Johann Baptist Cramer. A performance of the Mozart concerto was taking place in the park. At a certain passage Beethoven grabbed his friend by the arm and cried out, “Cramer! Cramer! We shall NEVER be able to do anything like this!” Indeed, Mozart’s fondness for the key of C minor was taken over by Beethoven in such works as the Pathétique piano sonata, the sonatas Op. 10/1 and 111, the violin sonata Op. 30/2, the string quartet Op. 18/4 and the Fifth Symphony. In turn Beethoven’s Third Concerto influenced Rachmaninoff, who took over some of its characteristics (the key of C minor, the use of an exotic key, E major, for the middle movement, and a fugal passage in the finale). The first movement combines bravura and fire; the second is a profound spiritual experience, and the last movement a gypsy romp. Do you have a favorite movement? If so, which one and why? I don’t, because each is so intensely and irresistibly different, but the finale is particularly fun to play. You’re known for your ability to improvise in the style of great composers, such as Mozart and Beethoven. Will you have the opportunity to improvise in these performances — will you play your own cadenzas? Yes, I shall be improvising a total of five cadenzas — the long one in the first movement, and slower ones in the second movement (1) and the finale (3). These will stay within Beethoven’s language and are high-wire acts, because I do not prepare: they are absolutely off the cuff. Tell us about guest conductor Bernard Labadie. How often have you two had the opportunity to collaborate? Numerous times, in Canada and the U. S. I have enormous respect for Maestro Labadie. His recording of my completion to the Mozart Requiem, made immediately after 9/11, is one of the best. Collaborating with him is a great pleasure. The programs also feature Mozart overtures from Don Giovanni and La clemenza di Tito. As a Mozart scholar, is there any other background or context that might fascinate or intrigue audiences about either of these two works? Both were “rush jobs” at the last minute: Mozart wrote down the overture to Don Giovanni in the wee hours the night before the premiere: Constanze had to keep plying him with coffee and tell him stories to keep him awake. One can see this in the autograph: the notation of the first violin and bass lines is clear and careful, the other string voices a bit more hurried, the winds a bit more so and the brass and timpani are written at breakneck speed, with the note stems, which should be vertical, all drawn toward the right in a desperate attempt to get the overture on paper so the copyist could prepare the orchestral parts on time. In the case of La clemenza di tito the entire opera was composed in something like three weeks; Mozart did not have enough time to write the recitatives himself and his assistant, Franz Xaver Süssmayr (who later had the unenviable task of trying to finish the Requiem so that Mozart’s widow could receive the second half of the commission fee, which she needed urgently to feed her two sons) had to take that job over. These concerts follow the Thanksgiving holiday, which is centered around food and family. We contend attending live music also makes for a lovely holiday tradition. What are you thankful for this year? I am perpetually thankful that God brought my beloved wife, the piano virtuoso Ya-Fei Chuang, into my life. A piece of music tells a story. If you don’t tell a story that grabs the audience, no-one will listen. Be brave, take risks, build suspense, joy, terror, ecstasy. Keep people up at night thinking about how your performance changed their understanding of life. Do for music what Meryl Streep does for acting. After Kansas City, where do you go next? What are other upcoming highlights for you this season? To Juilliard, for one of my guest stints there; then to Burgundy to perform and record the Schubert piano trios with Noah Bendix-Balgley (concertmaster of the Berlin Philharmonic) and Peter Wiley (formerly of the Beaux-Arts Trio). In February I record nine of the Mozart sonatas on his piano for ECM (the other nine will be done in 2018). In March I tour for the second time with violinist Hilary Hahn. Later in the spring I solo with and conduct the Stuttgart Chamber Orchestra. When you’re not making music, what other pastimes do you enjoy? I’m a streetcar/light rail enthusiast. I can’t wait to get back to Arthur Bryant’s for a burnt ends sandwich. Secure your seats to “Mozart, Beethoven and Haydn” by calling the Symphony Box Office at (816) 471-0400 or selecting seats online here. Tickets start at $25.